As long as the voters of San Diego are willing to punish politicians for subsidizing a new Chargers stadium, or as long as the law is interpreted that such subsidies require a public vote, there is no way that the Chargers can remain in San Diego for much longer. Numerous studies have shown that the value of a football stadium to a city is never more than the amount of money plowed into subsidies, so there will never be a viable economic argument for a new stadium, and I think San Diegans understand that. See Pacific-Standard for a great summary of the issue in general in America.
. . . from 2001 to 2010, 50 new sports facilities were opened, receiving $130 million more, on average, than those opened in the preceding decade. (All figures from Long’s book adjusted for 2010 dollars.) In the 1990s, the average public cost for a new facility was estimated at $142 million, but by the end of the 2000s, that figure jumped to $241 million: an increase of 70 percent. Due to these oversights, Long calculates that economists have been underestimating public subsidies for sports facilities by 25 percent, raising the figure to $259 million per facility in operation during the 2010 season. 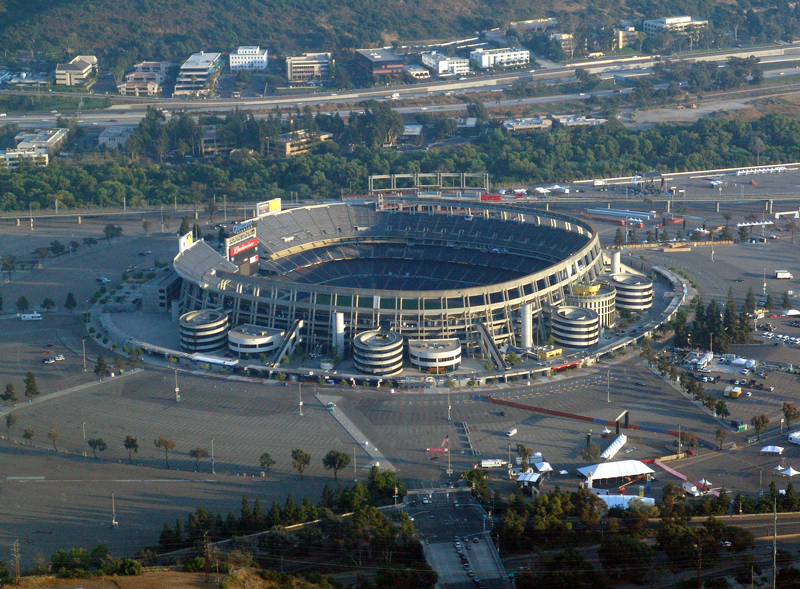 This only leaves emotional arguments about the value to the city of being in the “big leagues.” However, even with the Chargers threatening to leave, the latest polls indicate that the public is unwilling to subsidize the team to stay in San Diego, with 54% disapproving of using tax dollars to keep the Chargers. However, the situation is also unfair from the Spanos family’s viewpoint. Other cities are willing to subsidize their football teams with money for stadiums, so San Diegans attitude puts the Spanos’ Charger team at a competitive disadvantage. They have to compete against teams in larger markets who are playing on subsidized ballfields. The interest on loans to build a stadium is money not available to pay players salaries. If the Chargers are a business, then they would be crazy not to look to move to a location where subsidies drive down their costs. Ultimately, the business with the higher cost goes bust. In the NFL, this would mean never being in contention and slowly losing your fan base. Also, if the Chargers aren’t going to receive subsidies, then moving to a larger market and sharing the costs of a stadium with the Raiders in Carson is still better than footing the bill alone in San Diego. The real problem is that politicians in most other states and cities are willing to ignore public opinion and provide tax payer funding to professional sports franchises. They do so, even when the public votes against ballot measures, like in Pittsburgh. In such an environment, the only way to win is not to play the game. But it means the Chargers have to go. There are always solutions. No New Taxes. No Public Vote Required. Need State Legislation. Please see our proposed Waterfront Contiguous Stadium and Convention Center Expansion paid for by moving Airport/Port Infrastructure CIP projects to SANDAG. The airport will be issuing $1.6 BILLION in Airport Revenue Bonds between now and 2019, mostly for another above-ground Parking Structure in front of the new Airport Terminal 2. What is a better use of Fees collected on public State tidelands: a new parking lot, or the base for a Convention Center Phase 3 Expansion? Additional Funding for the Cistern Structural Foundation below the Stadium/Convention Center can be paid with State Water Bonds. The current US Bulkhead Line on San Diego Bay was last established in 1850. Climate change and sea level rise requires a Waterproof Bulkhead along all State Tidelands. All costs for the NFL Stadium portion will be paid for by the Chargers and NFL. As the linked article points out, as well as other articles on SDRostra, the revenue from a stadium revenue bond is unlikely to be paid back by stadium revenue. With respect to the water bond proposal, is it really the best use of resources to divert water dollars when we are suffering from drought. Given the needed changes in the state legislature, I don’t think this plan will work. I admit that it has attractive elements, not the least of which is spreading the cost out to the county. However, the hurdles look too great. I concur. The Chargers will have to go — assuming they can find a better deal (demographics plus subsidies) elsewhere. It’s likely it’s time for us to say “goodbye and good luck” to the Chargers. As far As I can tell, there is NO WAY that it makes economic sense for us to have the Chargers remain — for EITHER San Diegans OR the Chargers. Remember, taxpayers coughing up an absurd $800 million or more for the stadium is only PART of the cost we would have to incur. The purpose of the new stadium is to charge the fans more — a LOT more. Assuming the Chargers make $50 million more annually from the new stadium (their figure! ), that means that each home game they’ll pocket $6.25 million extra (the exhibition games can’t raise prices — no one would show up!). Assuming 62,500 fans average per game, that means that the average extra profit PER FAN would have to be $100 — including sky box attendance. That’s not charging $100 per ticket. That’s $100 MORE per ticket than fans now pay! If there is some other market that will pay such outrageous prices and provide such huge stadium subsidies, the Chargers should go there. We can’t and we won’t. Oh, one other “unintended consequence” of the $100 per ticket price increase — the Chargers will seldom meet the “blackout” criteria. Viewing home games on our HD TV’s will become a thing of the past. Your overall analysis that having the taxpayers pay for a new stadium cannot possibly pencil out economically is correct. However, some of the parts of that analysis are not even close. 1. The price of exhibition game tickets is the same as that of regular season games, and season ticket holders have no choice but to buy those games as well. 2. While the “average price” of a ticket may have to increase $100 (less counting exhibition games) in order for The Chargers’ revenue to increase $50 million per year, the “average ticket” will not increase in price anywhere near that amount. The vast majority of the increased revenue will come from the selling of Personal Seat Licenses and Sky Boxes, not from seats in the end zone and the View sections. HQ, that’s why I use the term AVERAGE. Clearly many will pay more and many will pay less. But even the Chargers don’t think the PSL approach will work in small market San Diego. Moreover, PSL’s are NOT a recurring income stream as you assert, while the Chargers are talking about a $50 million ANNUAL revenue increase. As I understand it — the Chargers would use whatever PSL windfall they could score (a mostly one-time windfall) towards their part of the stadium spending. As to sky boxes, the Chargers plan to boost the rent dramatically (supposedly 75%), but they already have a vacancy problem, plus many (30%, according to the Chargers) of the sky box lessees are from OC and points north — that largely goes away with one or more NFL teams in LA. We are a branch office town, with many start-ups who can’t afford sky boxes. There ain’t many Qualcomms in this berg that can afford a sky box. No matter how you slice it ($100 a ticket for 8 games or $80 a game for 10 games — two of which are of greatly reduced value), it’s a ticket price increase that many will not be able to afford — especially families. BTW, those “bargain” end zone and nose bleed seats will be fewer in number, as every version of the new stadium calls for FEWER seats in a San Diego market. The CARSON stadium is touted at 73,000, but they have a MUCH larger market to sell to. I understand what average means and I also know that you can drown in water that has an “average” depth of less than one inch. My point was that the casual fan who goes to 1-2 games per year and is now paying $50-70 per ticket will not all of a sudden be paying $150-170 at a new stadium. I believe your post would have given most people that impression. Uhhh, HQ this board is not read by average (let alone BELOW average) voters. Of course, you know that, but you pretend that somehow I’m confusing our dear readers. BTW, with seat licensing (if perchance it works), there won’t BE so many of those “casual fan” seats available. Not for direct purchase, anyway. I guess it makes as much sense for you to harp on the “casual fan” below average ticket price as it does for me to harp on how much MORE it will cost the fans for the above average seats. But then, I didn’t harp on the above average seat prices. YOU cherrypicked, not me.